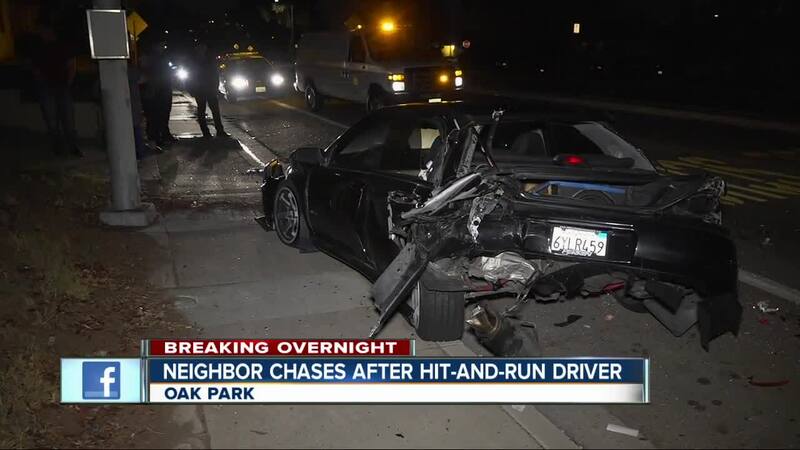 SAN DIEGO (KGTV) - An Oak Park resident chased down a driver suspected of hitting his parked car and fleeing the scene. The incident happened shortly after 12 a.m. Wednesday in the 2400 block of 54th Street, according to San Diego police. Witnesses told 10News they ran out of their homes after hearing a loud crash and found a parked car had been hit and spun around by a white sedan. Several witnesses tried to talk to a man and woman inside the white car, and one witness told 10News he could smell alcohol on the man’s breath. After a few minutes, the couple returned to their car and drove away, leaving a trail of debris and vehicle fluid on the roadway. The owner of the smashed car got into an SUV and followed the white car for a few blocks until it broke down. Police officers arrived at the scene and arrested the man on suspicion of drunken driving. 10News learned the woman was arrested on outstanding warrants.